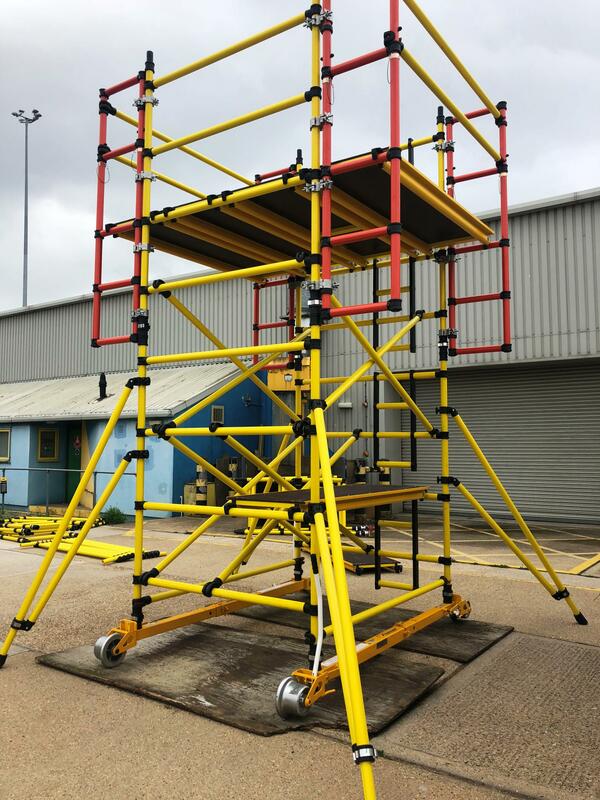 Pictured is a rail mounted insulated fibreglass cantilevered access tower, designed and manufactured for use in a train wash to access motors and lights, it had to be insulated and required reach out on both sides. At the time of delivery and commissioning we were unable to gain access to track side, so as you can see we set the system up away from the train wash, and carried out the training at the same time regardless. All the customers engineers were PASMA trained so it was just the mounting on the bogie, and the cantilever installation that really needed to be covered. The bogie is braked at all times, and moved by releasing both brakes, it is also secured onto the rail head when in the desired position. We supplied enough parts to build the tower to a platform height of 4200mm, shown is the intermediate height required which is 3000mm.